Stiga Daytona Table Tennis Table - T8127 Black Top. Shipping included in the price of the product when shipped to the contiguous 48 United States. The Stiga Daytona Table Tennis Table is the next step above the Spyder table. The table top is 9 ft. long and 5 ft. wide. This unit is easily moved around and stored using it folding mechanism and 3 inch casters. Two of the wheels have brakes for greater control and stability when moving the table around. Table is easily set up so you can start playing soon. 5/8" Black top playing surface. 1.5" Steel apron for extra table support. Patented design allows you to take the unit from box to play very quickly. 1.5" Round steel tube legs for stability. 3" Mag wheel casters, two with brakes for mobility and stability. Rigid Unibody chassis for added strength. Includes a net and posts. Edgebanding and silk-screened striping regulation styles. Comes with a 90-day warranty from Escalade Sports. Corner protection pads prevent snags. Great table for players ages 9 and up. Shipping Dimensions: 63.5" x 56.5" x 6". Assembled Dimensions: 108" x 60" x 30". Folded-Up Dimensions: 32" W x 60" D x 62" H.
Product ships from the warehouse in San Diego, CA. 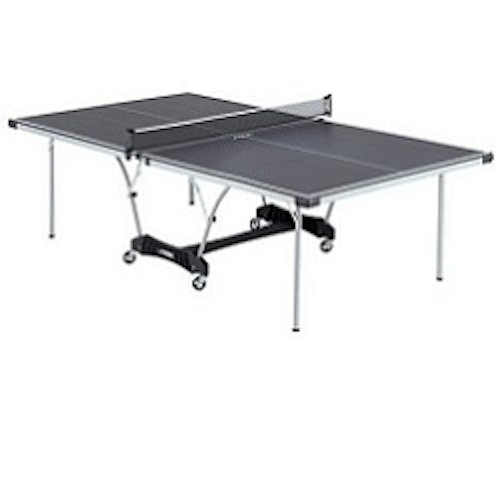 Competitive Edge Products, Inc. is an authorized dealer for the Stiga Daytona Table Tennis Table T8127. We will try to match or beat any online competitor's advertised price (price of the product + shipping costs). Dimensions: 64" x 57" x 6"